I've been wanting to check out the Mistborn series since, well, forever, but just never got around to it. I finally decided that a good way to combat my procrastination would be to get this on audiobook, so that I'd end up listening to it on my commute to/from work, while walking, while cleaning, etc. 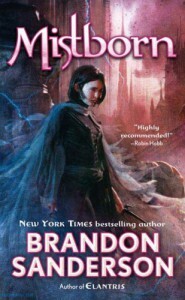 Generally, I only listen to my audiobooks in those aforementioned times, but Mistborn was different. This book was so engaging - the characters, the story, the world-building - that I couldn't make myself stop. Rather than keep this to my scheduled "audiobook times" during the day, I was listening to this book every second I got. I also ended up downloading the ebook, because I was so impatient to find out what happened and I knew I could read faster than the audiobook could read to me. Let's start with the story. The premise is immediately intriguing - What kind of world results when the hero of prophecy fails? That of Mistborn, which is ruled by the oppressive deity-like Lord Ruler. In this world, there is also great economic and social disparity between the nobility and the skaa (peasantry). A rebel named Kelsier puts together a small but talented "thieving crew" and charges them with the daunting task of putting together a successful skaa rebellion, which is not quite the normal kind of heist that they are used to, to say the least. One of Sanderson's most impressive skills is the way in which he masterfully weaves this story. The writing itself isn't anything special, but the careful and thoughtful threading by Sanderson more than makes up for it. For example, the story begins in the point-of-view of a nobleman who is completely non-essential to the overall story, just so that we get an immediate feel of how the skaa are treated and perceived in this world. Another example consists of the short narrated sections at the beginning of each chapter. As the book progresses you slowly come to learn more about this mystery narrator, and it's hard to explain the details here (for spoiler reasons and such), but just trust me in that it's all done brilliantly. But where the book truly shines is in its characters. I don't think there are many book characters that I love or will ever love as much as Kelsier. He's charismatic, loyal, smart, driven, and full of hope. Yet, he's still flawed - he lusts for the blood of the nobility, refusing to see them as individuals and instead seeing them as an oppressive whole; his tactics for completing his tasks are often Machiavellian in nature; and, he has a huge ego. Then, there's Vin, the true main character of the book (in my opinion), and well, she's awesome, too. Want to read a book with a strong female protagonist? Then, this one's for you. Vin is a very developed character, and to witness her journey and growth from the beginning of the book to its end makes you care fiercely for her. The secondary characters are also great. Even though you don't get insight into their lives (much) like you do with Vin and Kelsier, they still all have very distinctive personalities. Plus, in Mistborn, it's not just the characters that are impressive, but also the relationships between the characters. Finally, let's talk about world-building. The magic system (allomancy) is complex and original. Allomancers have the ability to use metals in order to fuel a variety of physical and mental enhancements and abilities, and well, it's pretty damn cool. As for the world itself, we aren't exposed to all too many parts of it (geographically), but you really get a feel for the dystopian setting. The skaa, the nobility, the Steel Ministry (consisting of obligators and the terrifying inquisitors), the mists and the kandra, the keepers - simply put, there's a lot of interesting stuff to delve into. I can't wait to find out more (in future books, presumably) about how the world turned into a place covered with ash, a place with no plants, a place of such desolation. I guess I haven't said anything bad about the book in this review, and believe me, I'm trying to rack my brain for something, but nothing is coming to mind. I think that any fantasy genre lover should read this, most definitely.